Who is Teaching Doctors About Hyperparathyroidism? An Endocrinologist's Perspective of this Overlooked Disease. Most of the time the patients sent to my office who have hyperparathyroidism have been dealing with their "problem" for many years. Often they have seen several other doctors who haven't been able to figure out what is going on. My experience has enabled me to have a better insight to some "ongoing" complaints, which ultimately prove to be some of the classic symptoms of primary hyperparathyroidism. Fatigue and constant tiredness is the most common complaint, but sometimes it's hard for the patient to put into words how they feel. They just say "something is wrong!" I am going to briefly review three common scenarios that I often see where the patients had primary hyperparathyroidism that was overlooked by their other physicians. The diagnosis of hyperparathyroidism can sometimes be very obvious if somebody had just thought about it. These patients are typically very happy to learn that there is a reason they feel bad. They are happy that their problem has a name (primary hyperparathyroidism) and they are happy that their problem can be cured with removal of the causative parathyroid tumor. From my perspective, the problem is that many doctors don't know much about hyperparathyroidism and so they aren't looking for it. Sometimes other endocrinologists have been consulted and the diagnosis has been shrugged off saying "the calcium is only a little bit high, so it can't be making you feel bad". Sadly, many doctors don't understand the importance of high blood calcium, and don't understand the many various ways that hyperparathyroidism can make people feel. Endocrinology Scenario 1: The Patient with "Normal" Calcium and Low Vitamin D.
Secondly, the "normal" range of calcium printed on many lab results is too broad. Most experts agree that a normal calcium should remain around 9.5 to 9.7 mg/dl with little fluctuations. A calcium that is reportedly "normal" at 8.5 mg/dl is too low. Conversely, the normal range of calcium should not be up to 10.6 mg/dl. I evaluate calcium levels that are consistently elevated combined with an intact parathyroid hormone level to rule-out primary hyperparathyroidism. I find a large amount of patients who have been told that their calcium level is "normal." However, after reviewing their charts and seeing years of elevated calcium over 10 mg/dl with the newly ordered elevated PTH, it is made apparent that they have primary hyperparathyroidism. Do not be fooled by a "normal" calcium, especially in the patient that has the symptoms of primary hyperparathyroidism. Editor's note: See the page on Parathyroid.com that discusses calcium normal ranges for adults vs. teens. Adults should not have calcium levels "in the 10's". Dr Metcheck is talking about the fact that many labs do not correct the normal range for calcium based upon the patient's age. The graph above shows where this incorrect high calcium level comes from-it is correct for teenagers but not for older adults. See our previous blog on this topic. Endocrinology Scenario Two: Post Menopause Woman With Osteoporosis. As an endocrinologist, the second scenario that I see that fails to diagnose hyperparathyroidism is when doctors are treating post-menopausal osteoporosis. 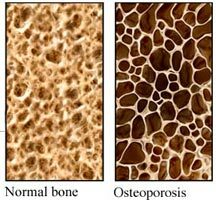 I am consulted on many cases of osteoporosis where patients’ bone density are worsening despite therapy. After ruling out compliance issues (making sure they are taking their calcium and osteoporosis medications), it is important to rule-out other conditions which may be contributing to the ongoing bone loss. Prior to the initiation of medications for osteoporosis, I order labs to rule-out various other endocrine disorders which could be contributing to their bone loss. One of the most common causes of osteoporosis is primary hyperparathyroidism. By ordering basic labs prior to any initiation of medications, I am able to detect patients’ whose bone loss is being significantly magnified by primary hyperparathyroidism and the over-production of parathyroid hormone (PTH) which is removing calcium from the bones. This includes patients who are losing bone despite proper therapy; patients may be failing therapy because they were not properly diagnosed with primary hyperparathyroidism. The primary hyperparathyroidism was too powerful to overcome with medical therapy. The primary hyperparathyroidism needs to be corrected first before you will see considerable improvements in your bones. Medications can only work properly when there are no other factors contributing to the bone loss. Remember, there is no medical therapy for primary hyperparathyroidism. Endocrinology Scenario Three: Negative Sestamibi Scans. During a routine examination on a new patient in my Lake Mary, Florida endocrinology office two weeks ago, blood work was drawn which revealed an elevated calcium level of 11.6 mg/dl. I called her two days later and had her return to the office to discuss the high calcium. She relates that she has been to four other physicians over the past four years, all of whom knew she had high blood calcium. She was told that she had high calcium and high parathyroid hormone (PTH). Of course I wanted to know why she didn't have an operation to remove the parathyroid tumor so she could feel better. Her answer: she had a nuclear scan (sestamibi scan) which did not show anything so she was told she couldn't have surgery. She also saw another endocrinologist in the past who got another sestamibi scan. When that scan was negative they told her that nothing could be done and instead started her on Vitamin D (which caused her calcium to be even higher!). A repeat lab assessment at my office confirmed the elevated calcium plus an elevated parathyroid hormone level of 121 pg/ml. She was extremely fatigued and had considerable weakness. She had primary hyperparathyroidism but was going to multiple doctors because none of them knew what to do about it-they were relying on the results of scans to guide their medical decisions. Hopefully the reader of this blog is educated to know that scans are wrong more often than they are right, and therefore, we can't use scans to determine who has hyperparathyroidism, and we can't use scans to decide who gets an operation and who does not. As an endocrinologist it is frustrating when doctors order sestamibi scans and don't understand the implications of the findings. When the scan is positive it is often wrong and under estimates the number of bad parathyroid glands. When it is negative it is just plane wrong and needs to be ignored. Because sestamibi scans are wrong so much of the time, and because we can't use them to make any decisions, we don't get them on our patients. That's right, this endocrinologist doesn't order sestamibi scans. Instead, I send my patients to have all of their parathyroid glands examined by one of the expert parathyroid surgeons in Tampa. Working together with surgeons who have lots of experience helps the patients get the best care, and makes my life as an endocrinologist easier and more rewarding. Need an Endocrinologist for Thyroid or Parathyroid Problems in Central Florida? Editor's note from Dr Norman. From time to time we will have a guest blogger to provide some insight about hyperparathyroidism from a different perspective. Since our patients come from all over the world, we get to recognize which endocrinologists understand parathyroid problems and which "don't quite get it". Lee Metchick is one of the great endocrinologists who "get it". He is smart, knowledgeable, and cares a lot for his patients. He is gifted at thyroid ultrasound and the treatment of thyroid disease. I strongly encourage anybody in the central Florida area and over into the east coast of Florida with a thyroid or parathyroid problem to seek Dr Metchick's care. His practice website is Endocrinology of Central Florida.